Christmas fun starts off early for residents of Claremont Towers. On Saturday, December 2nd, one can take the family down to the Hillsborough Township Volunteer Fire Company #3 and Auxiliary to have breakfast with Santa. There are two breakfast buffet sessions: the first at 8:15am and the second at 10:45am. (2) On December 9th, young children will enjoy getting to visit Santa’s live reindeer at the Belle Mead Animal Hospital. If one wishes to help out the less fortunate, a clothing drive will be held at the Hillsborough High School on December 9th. Sunday, December 10th, finds a few holiday-themed events for locals and visitors to enjoy. The Central Jersey Regional Airport will see Santa flying in to give presents to local boys and girls. Proceeds are to benefit the Rotary Club of Branchburg. To find that special ornament or keepsake, residents of Claremont Towers can visit the Winter Craft Fair held at the Princeton Elks Lodge 2129. A popular event is the caroling concert held by the Raritan Valley Choral Society at the St. Joseph Church and Parish Center. Many classic favorites will be featured, and one can purchase a tin of fresh-baked cookies for ten dollars. A popular destination for those living at the luxurious Claremont Towers is the Morven Museum & Garden. Christmas takes on a special feeling while being celebrated within the 18th century building. Families can enjoy the two Storytime at Morven events held in December. The first is held on December 7th and features The Trees of the Dancing Goats and Willowby’s Christmas Tree. The second takes place on December 28th and features Snowy Day and The Mitten. Also taking place at the Morven is the Festival of Trees, which is open through January 7th. (4) This annual event is a crowd-pleaser as the museum’s elegant porches, hallways, and galleries are filled with Christmas trees that have been artfully decorated by local groups and businesses. As one can see, there is plenty of holiday enjoyment to be had close by to the Claremont Towers apartment complex. 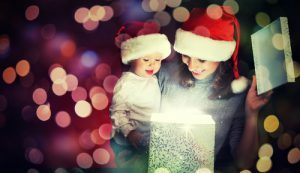 Individuals and families have lots of options to make the Christmas season a joyous one, from visiting Santa to listening to some Christmas stories to feeling young at heart watching model trains race around the tracks.